Turning a Waste Into a Healthy Chutney! 1. Remove the skin of the ridgegourd and cut it into medium pieces. 2. In a pan, heat 1 teaspoon of oil. Add asafoetida, Urad Dal, red chillies, and ridgegourd skin pieces. Fry till the ridgegourd skins turns light brown. Then, add tamarind paste and fry for two-three minutes. Cool it down. 3. First put the Urad Dal, red chilli, asafoetida, tamarind paste, and salt in the mixie and grind it to a powder. Then, add ridgegourd pieces and grind it again in pulse mode for few seconds. 4. In the same pan, heat 1 teaspoon of oil and splutter the mustard seeds and curry leaves. Add these to the thuvaiyal. Now, Peerkangai Thoel Thogayal (Ridgegourd Skin Chutney) is ready! I cook dal everyday for my little one. So, I try a lot of recipes using moong dal. 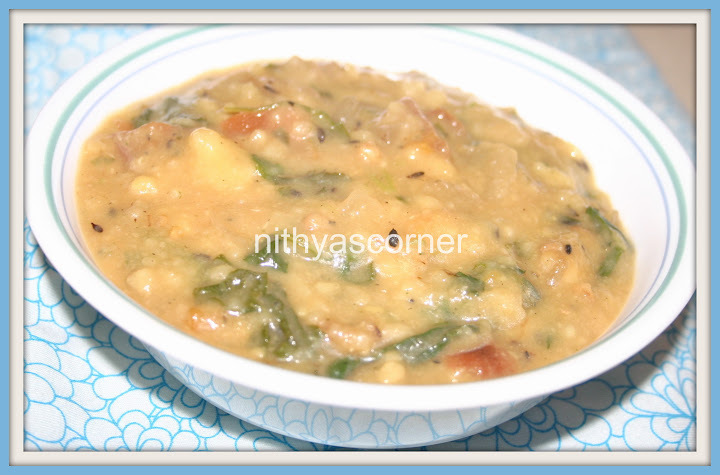 One such tried recipe is this Methi Moong Dal.I do not remember from where I learned this recipe, but this is definitely a tasty and healthy dish. I have it along with hot rice, chappathi, rotis etc. Minced green chillies – 3 nos. Beginners, you may refer “How to buy, store and cook moong dal?” as a quick reference. 1. In a pan, heat oil. Add the cumin seeds. When the seeds pop out, add ginger, turmeric powder, and green chillies. 2. Add the chopped onions and fry until they turn translucent. Now, add the tomatoes and saute for few minutes. 3. Add methi leaves and fry for 3 minutes. Do not overcook the leaves. Now, add the cooked moong dal, 2 cups of water, salt and mix well. Boil well for 5 more minutes. Now, Methi Moong Dal is ready!